* This catalogue is for knitting and crochet patterns only. Purchasers receive a link to a downloadable pdf file of the pattern. The pdf file is hosted by Ravelry.com. * Note: the sales links below are handled by www.ravelry.com and Paypal, via Paypal’s secure site. If you buy a pattern, we receive your email address, but not your payment details or personal information. We will not forward your email address to any third party. 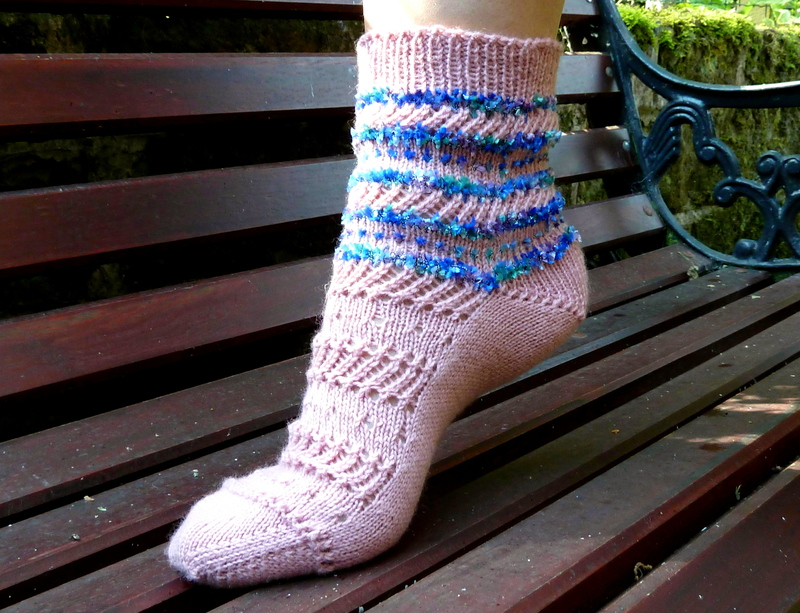 Short summer socks with a highly decorative leg in lace and Sirdar reflections eyelash yarn, and a lace instep. Sizes: women’s small, medium and large. Needles: for toe-up version: 2 circular needles for knitting either one at a time or both at once, or one circular to knit with magic loop. For cuff-down version: 4 dpns.